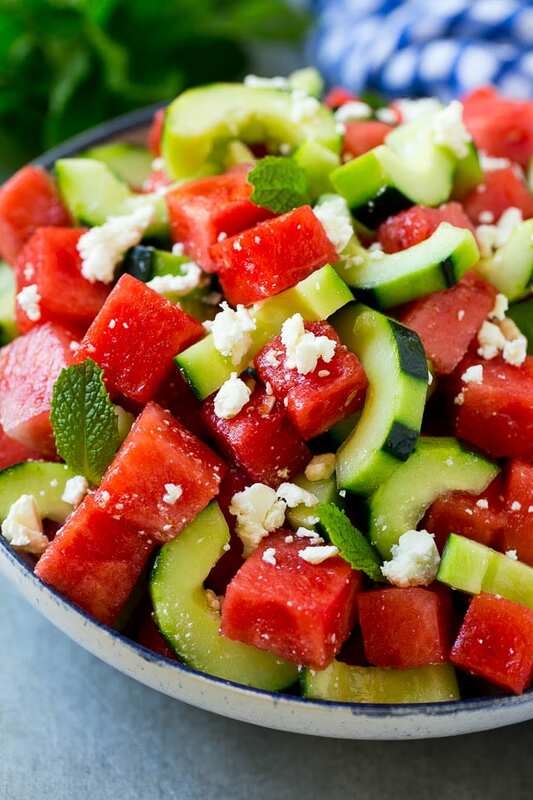 This watermelon salad is full of sliced cucumbers, crumbled feta cheese and mint, all tossed in an easy lime dressing. A simple yet unusual summer salad that’s sure to get rave reviews. Watermelon feta salad is one of those flavor combinations that sounds odd, but just works SO well together. Add some crisp and refreshing cucumbers and mint to the mix, and you’ve got a fresh and colorful side dish that everyone will love. One of my fondest summer memories is the watermelon seed spitting contests I would have with friends and family. This watermelon salad doesn’t contain watermelon seeds, but when I was preparing it, I couldn’t help thinking back to those times. The fresh watermelon and cucumber truly make for a delicious and refreshing combination on a hot summer day. HOW DO YOU MAKE WATERMELON SALAD? 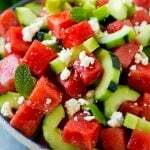 For this recipe, you’ll need cubed watermelon, sliced cucumbers, crumbled feta cheese and mint leaves. A simple lime dressing goes over the top of the salad and everything is tossed together for a fresh and colorful dish. The sweet watermelon with the salty feta is a flavor pairing that may sound unconventional, but it truly is amazing. Just as a heads up, it can be temping to by the pre-crumbled feta because it’s more easily available and ready to just dump into a salad. However, the blocks of feta are much more flavorful even if they take a touch more work to crumble up before adding to the dish. With this watermelon cucumber salad, any type of cucumber is fine as long as you remove the seeds before slicing. I cut my watermelon into chunks because it’s quicker and easier that way. 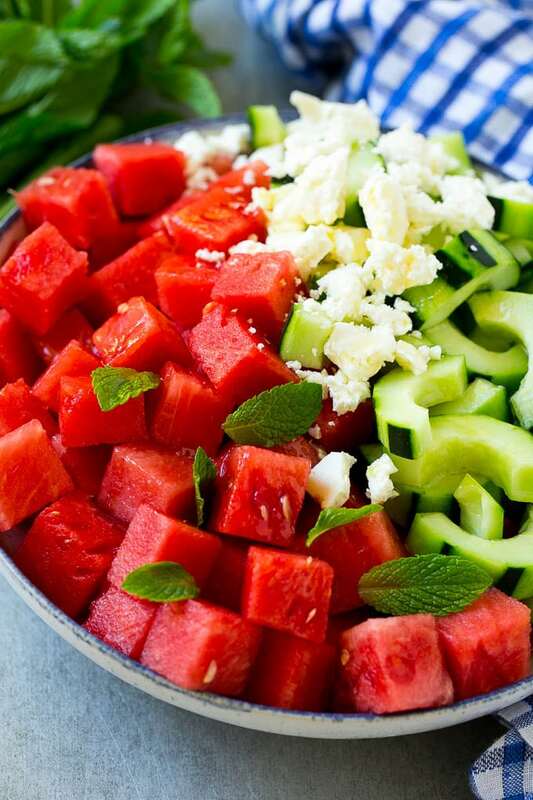 However, you can use a melon baller if you’re looking for a more elegant presentation for your watermelon feta salad. I add the mint at the very last second, as cut mint can turn brown over time. Small, whole mint leaves or thinly sliced pieces of mint are best suited for this watermelon salad. WHAT IS THE DIFFERENCE BETWEEN ENGLISH AND REGULAR CUCUMBERS? English cucumbers are often sold wrapped in plastic. They are typically seedless and do not have the waxed coating like standard cucumbers. 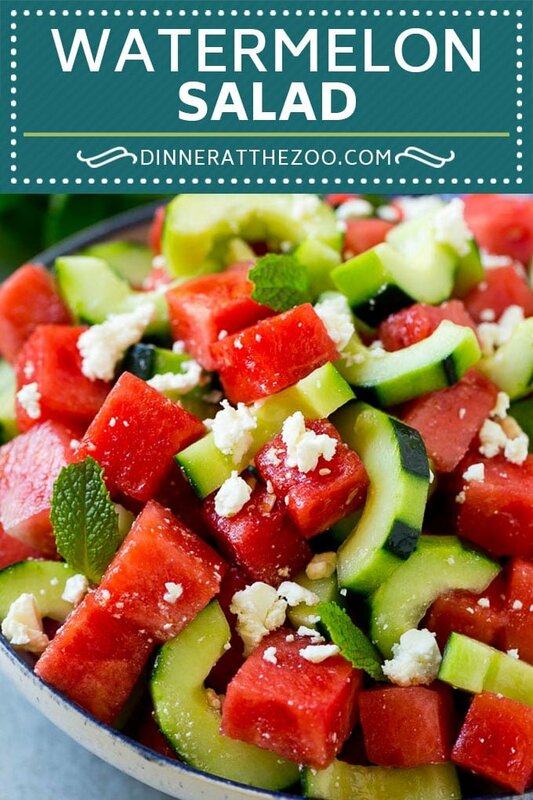 Regular cucumbers are more commonly sold outside of a package and definitely contain seeds that have to be scooped out for recipes like this watermelon feta salad. IS WATERMELON SALAD STILL GOOD WITHOUT THE DRESSING? This watermelon cucumber salad is still delicious without the dressing. However, the dressing ties all the flavors together and really completes the dish. Although I love the dressing, it’s not necessary for this watermelon salad to still be a refreshing delight. I haven’t made this salad as often as I should! I’ve brought it back out into the light this summer because I was reminded of how easy and delicious it is. It’s always a great hit at get togethers or just at home for a snack or side dish. 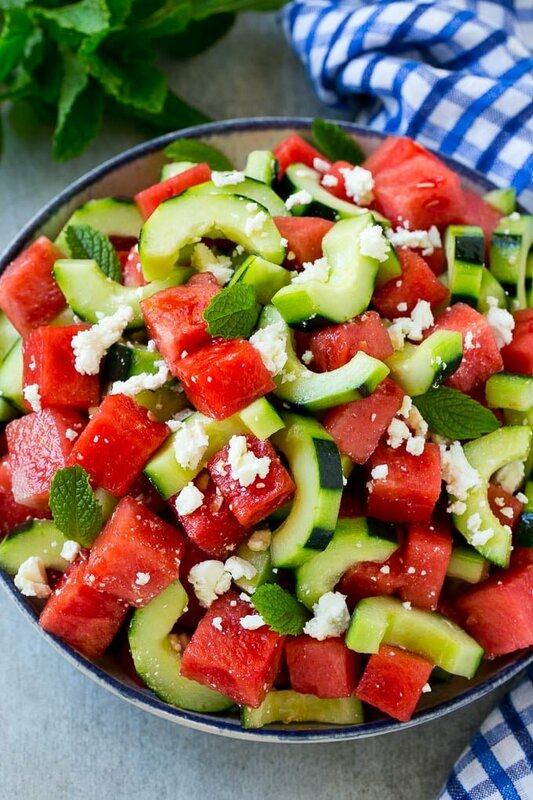 This watermelon salad is full of sliced cucumbers, crumbled feta cheese and mint, all tossed in an easy lime dressing. A simple yet unusual summer salad that's sure to get rave reviews. 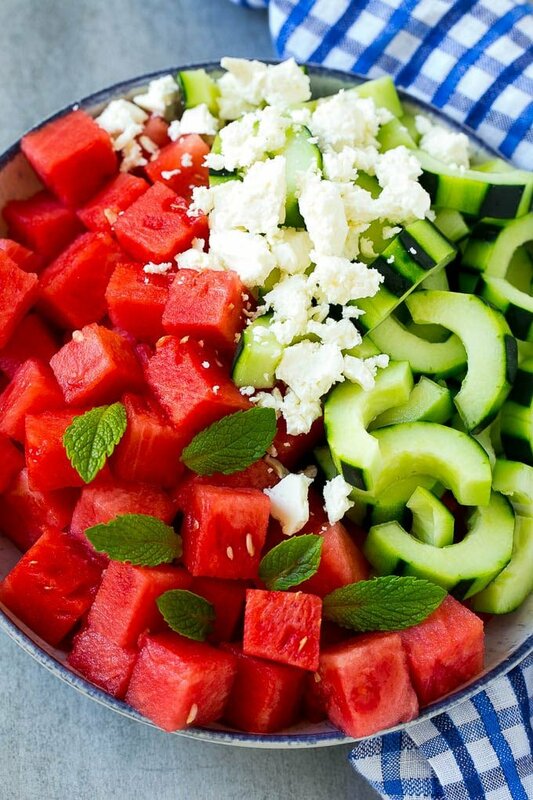 Place the watermelon, cucumber and mint in a large bowl. In a small bowl, whisk together the olive oil, lime juice and salt and pepper. Drizzle the dressing over the melon mixture and toss to coat. Sprinkle with feta and serve. A hit !!!! Everyone loved it !!! Thank you , thank you ! I’ve got mint in the garden and a wonderful watermelon in the refrigerator so sending out the hubby tomorrow for the feta! Wow, I have got to try this one. It looks so mouthwatering andamazing! Wow, that is a home run salad idea. Watermelon is the perfect summer treat. I have a friend who would 100% live off of this if she could. This honestly looks incredible!